Contrary to what its name might imply, this beautiful piece of land in the Aegean Sea is not tiny at all, rather it’s known to have it all. The raw beauty of the Cyclades and the rich culture of mythical Greece is infused in its remarkable unspoiled landscape. This extraordinary island is like a gift that keeps on giving, so why not give it to yourself by investing in an exceptional property on Tinos. Buying a luxury residence on the island of Tinos will allow you to become a part of this pure, untouched, and cultural landscape of the Cycladic archipelago. Because the island of Tinos has such a strong historical legacy, you might hear it referred to as Ophiussa and Hydroessa by Classists. But modern Tinos offers the best of many worlds: lively energy in its little alleys and tavernas; sanctity in the bustling chora or capital city called Tinos Towns, dominated by the historic Church of the Panagia Evangelistria, a popular site of religious pilgrimages; seclusion in the middle of nature, its mountains, rocky cliffs, crystal-clear waters and rustic Mediterranean terrain. For these reasons, buyers in search of a private getaway in the purest of environments, away from the glitz and glam of party islands like Mykonos (which is just 20 minutes away by boat) are often led to the island of Tinos. The real estate market of Tinos is known to attract affluent Athenians, but also foreigners, largely made up of French citizens, who want to buy or invest in exceptional properties on traditional settlements, just outside of enchanting villages, overlooking the sea. Whether a personal vacation home or investment property in Tinos – for example, entire residential complexes – you can find promising residences under-development and others that have been renovated to meet every criterion of contemporary luxury while keeping the charm of the regional architecture intact. These exceptional properties are made even more dreamy with their colorful gardens, antique windmills, airy terraces and verandas, and breathtaking panoramas of the bay. Each sunrise and sunset becomes more colorful, more vivid, and magical with every day. For the record, the return is priceless. Acquiring property on the island of Tinos will also allow you to discover its treasured towns, villages, and monuments, as well as its adventurist terrain and waters. Those with an eye for aesthetics will love studying the island’s collection of marble sculptures – it’s the largest in all of Greece! Both the Classists and the curious can dive into the past by touring ruins, archaeological sites, and religious shrines perched on towns’ hills overlooking the island. Hikers can take on the arid mountainscape for deep reflection and steep climbs towards ancient Venetian-style forts near the Volax and Examvourgo villages. Even those with fins for feet lose themselves in the calm currents of the Kionia and Agios Sostis beaches, while those looking for a deeper thrill spend time at Steno beach for an underwater peak at an ancient shipwreck. From intimate idyllic hamlets like Komaros to the sandy crescent beaches of Kolibithra, a go-to surf spot renowned for its potent Meltemi winds, the island is alive and full of thrills. 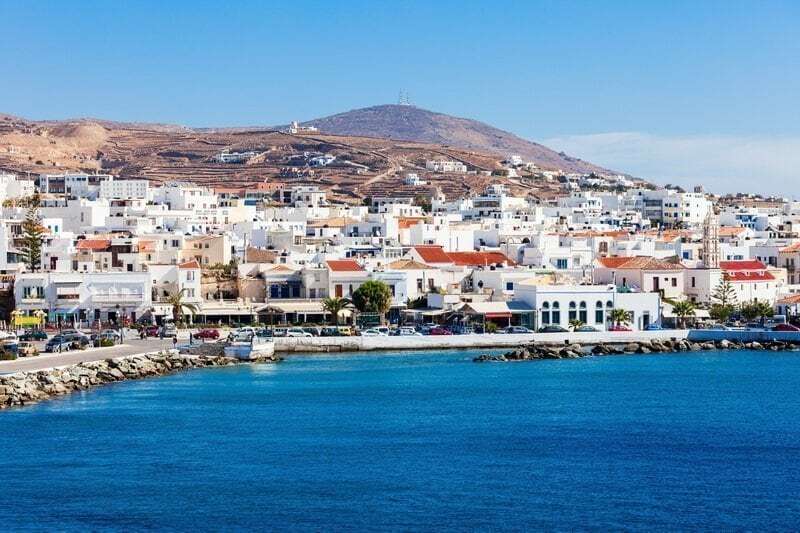 Located between Andros and Mykonos, just a 4 to 5 hour boat ride from Piraeus or Rafina port, the island of Tinos is also known for its authenticity, especially in the charming villages of Pyrgos and Komi that seem to be stuck in time. Tavernas serve Mediterranean cuisine prepared with fresh local products, making dishes a naturally healthy delight. Above all, Tinos is an island of well-being, a place to go refresh, realign, and reinvigorate the senses. Contact BARNES Greece to get more information about how investing in property on Tinos is not only good for the mind and body but also the spirit.